Mysteriously, numerous doctors along the English countryside are dropping like flies. The bizarre circumstances of their deaths attract the attention of Scotland Yard’s Detective Trout (Peter Trout) who is looking for any of connection. It is only when a brass amulet left behind at the murder scene of Dr. Longstreet’s (Terry Thomas) that he finally has his first real clue. Later, when it is determined that the amulet has a Hebrew symbol engraved on it, Trout is forced to turn to a local rabbi for help. There he finds out that the figure represents one of the 10 biblical plagues (boils, bats, frogs, blood, hail, rats, beasts, locusts, the death of the first-born, and darkness) unleashed on ancient Egypt. Not coincidently, each victim had been killed in a strange fashion that mimics one of the plagues. The plot thickens when all roads lead to one, Dr. Vesalius (Joseph Cotten) and with his help, they are able to conclude that the recently deceased all worked together on one single case, that of Victoria Phibes, who died on the operating table. 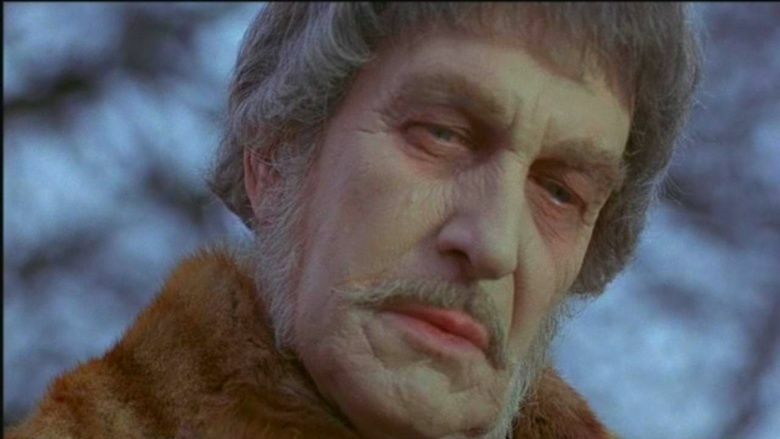 Her husband, Dr. Anton Phibes (Vincent Price) is quickly ruled out as a suspect because he reportedly died in a fiery car crash while racing back to be by her side. It is only after Trout and his partner find Phibes’ grave empty that the truth is revealed. The chase is on to stop the good doctor from seeking his final revenge. “The Abominable Dr. Phibes” served as one of those films that helped to transition the genre away from the Poison drove gothic horror of the ’60s towards a more ghoulish campy scene in the ’70s. This is truly a wonderful film on so many levels and one that I only recently have had a chance to view. It also helped to relaunch the career of Vincent Price as he again put his stamp firmly on the world of horror. Directed by Robert Fuest, most notably of the 60’s British TV series “The Avengers”, the film is a tongue-in-cheek rip-roaring ride into the dark mind of Dr. Phibes and his mad obsession. The music, the sets (very cool art deco by Brian Eatwell) and the macabre ways of Phibes killing all lead to a very rousing 90 minutes of pure fun. Three years after his disappearance and with the planets in proper alignment, Dr. Phibes rises from his dark tomb. Along with his lovely assistant Vulnavia (Valli Kemp), he plans to travel to Egypt obsessed with securing eternal life for him and his deceased bride, Victoria. One problem, the ancient scrolls that hold the secrets of life have been stolen by an archeologist, Dr. Biederbeck (Robert Quarry). Easily recovering the scroll in Phibistic fashion, the race is on to find the “river of life“. As the strange death count mounts, Detective Trout and his superior Waverly (John Carter) get a sneaking suspicion that their old friend has returned and head out on his trail. Along the way, Bierderdeck chases closely behind, driven by his own secrets. The final destination is reached in the deserts of North Africa, as Phibes and Vulnavia prepare for Victoria’s return. Unmerciful death falls on any and all adventurers who try to interferes with the good doctor’s work. Trout and Waverly arrive late on the scene to provide little more than comedy relief as Phibes and Bierderdeck lock in a battle for eternal life. More than an ample sequel to the brilliant “The Abominable Dr. Phibes“, “Doctor Phibes Rises Again” continues in its an exploration of the tortured soul of this madman. Reprising his role, Price is exquisite as Dr. Phibes providing strength to a film that may be a little short on plot. Director Fuest returns behind the camera along with Brian Eatwell, who resurrects his flair for art deco by bringing it to ancient Egypt. 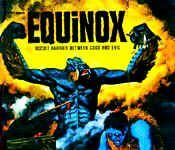 For years there was the talk of a third film, possibly “Doctor Phibes in the Holy Land”, but AIP and Samuel Arkoff squashed that when they saw blaxploitation as their future. It is really too bad because I think a trilogy would have been an excellent way to round out this series. Watch both films and enjoy the magic that is Vincent Price! !